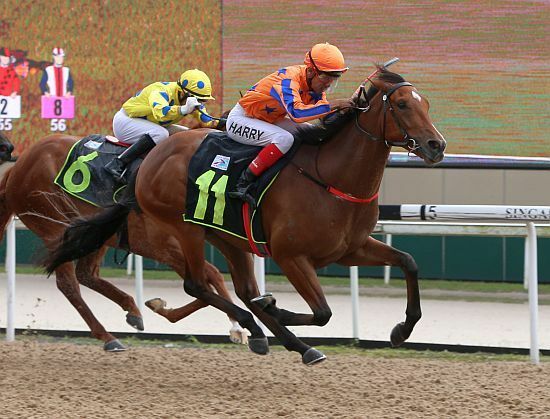 To say Te Akau Singapore trainer Mark Walker is running red hot would be an understatement. In the past 10 days Mark has trained nine winners: a winning double Friday week ago was followed by a winning treble Sunday week ago. Then this weekend he has been at it again with a winning double on both Friday and Sunday. Mark now has a clear lead of six wins on the Trainers’ Premiership, his tally not standing at 23. Trainer Mark Walker seems to have unearthed a promising two-year-old in Admiral Winston going with the impressive manner he powered home at his debut in the $75,000 Restricted Maiden race over 1000m on Sunday. With his yard currently firing on all cylinders, Walker later went on to saddle a double with $39 shot Ka Chance (Riduan Abu [Nik] Bakar) in the $20,000 Maiden race over 1100m.